LOS ANGELES (KABC) -- Family size can apply to meals, paper towels and cars. Now you can get a mattress sized for the whole family, too. 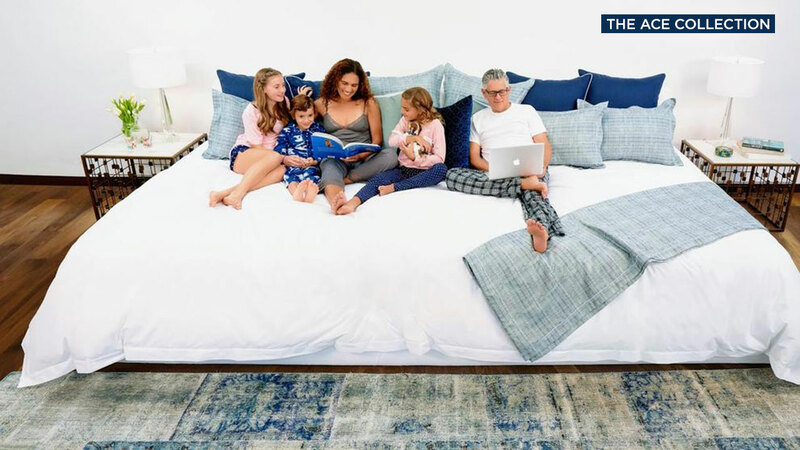 A Los Angeles-based designer has launched the Ace Collection, a series of beds with larger-than-life sizes, including one meant to group parents and kids together for some quality family time. The Ace Family Size mattress measures 144 inches wide by 80 inches long. That's 12 feet wide - or double the width of a California king size mattress. Designer Ana Pekarovic says clients have asked her in the past about extra-large mattresses to, for example, accommodate a whole family for movie night. She says the only options were expensive custom orders, so she set out to design her own line of extra-large mattresses. The company also offers two other unusual mattress sizes. Those include the Ace Size, which is 108 inches wide by 80 inches long. There's also a Player mattress aimed at athletes and taller people that is 108 inches long by 80 wide - basically a rotated version of the Ace Size. "The Ace Collection is all about bringing family and loved ones together in a shared comfortable space," Pekarovic said. "Everyone needs the gift of rest and comfort. It shouldn't be an unattainable luxury." The Ace Family Size mattress sells for a base price of $3,000. Shipping and installation on the West Coast can cost up to $500, with other parts of the country ranging up to $1,250.